This week I’ve been exploring the symptoms of nerve entrapment. In the early days, after I first had my stroke, I experienced a lot of problems sleeping. First of all I put it down to the hospital bed…. A side sleeper I just couldn’t find a comfortable position and often found myself waking in pain lying on my left arm , with my neck in a wrenched position. I blamed the bed… too small Goldilocks…. But guess what ? The problems continued when I returned home to my lovely king sized bed. 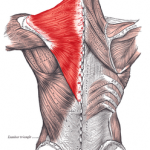 One day I experienced a painful knot in my Trapezius muscle… and now on reflection, I am beginning to understand that this may have been a precursor of some of the symptoms I am now experiencing. There are three major nerves that run from your neck all the way to your fingers: ulnar, median, and radial. The ulnar nerve runs along the inside of your arm and ends in your pinky and ring fingers. Entrapment of the nerve, is when the nerve gets trapped at a location, then when you move your arm the very taught nerve gets pulled and results in pain. What’s a bit tricky in recognizing that my pain, and some of my symptoms , could be a nerve entrapment issue, is that the symptoms of tingling fingers and sensory loss as a result of stroke are also a symptom of nerve entrapment. Nerve entrapment generally causes referred pain, meaning the site of the issue can cause pain in another area much like the shoulder pain I have had. By the by, did you know my maiden name was Holmes? I just have to keep digging….. It drives my hubby crazy because I have theories about a lot of things. This nerve thing though….. it so makes sense at the moment. So this is where my headspace has been this week. I have been working on loosing knots, and flossing my nerves! Coincidently there is every indication that my research will pay off, the tingling in my fingers is starting to ease. There are several nerve flossing videos on YouTube, here’s one that I’ve been incorporating to my rehab. * I want to caution anyone reading my account, that I am no medical expert, I am writing this as a personal account of how stroke has affected me, and it’s my journey of recovery.